pas | I Am Not A Restaurant! 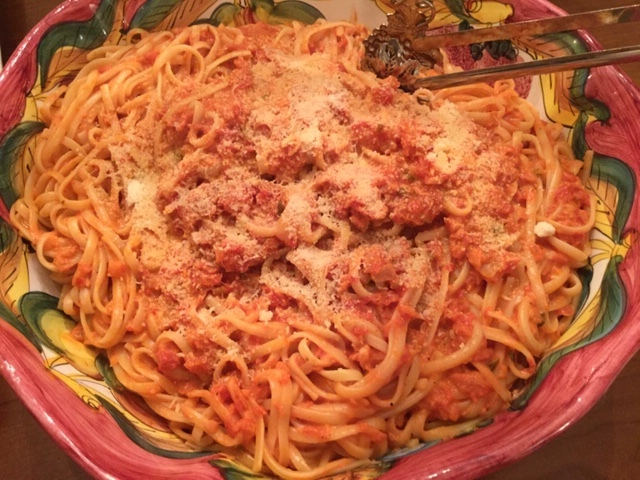 As promised … Pasta with vodka sauce. Not penne. Blame Trader Joe's, I do. Plenty of rice and gluten free options. Am I now a minority? So linguine stepped in and twirled its way round our hearts. Two kids took home leftovers, an endorsement if ever there was one. Any way you toss it, Ina did a great job with the recipe. I lightened the load a bit on the hot pepper flakes. I also think it covers more than a pound of pasta. Note: obviously can be gluten free. Just ask Trader Joe's.